Many of us, at least I think, establish family traditions around Halloween, Easter, Christmas, birthdays and similar but other than enjoying an enormous meal filled with delicious goodies and hopefully surrounded by family, I’m not sure how many people out there establish Thanksgiving Traditions. It is a holiday uniquely American (though Canada and a few others have their own Thanksgiving), yet I’m not sure how much we “celebrate” Thanksgiving beyond another holiday that you may get off? My memories from being a child are watching and eventually helping my mother cook Thanksgiving dinner. It has always been filled with at least one or two trips to the market for a forgotten item for the meal and finished with a delectable dinner of turkey, stuffing, grandma’s special cranberry relish, mashed potatoes and pie. But we really didn’t have traditions. 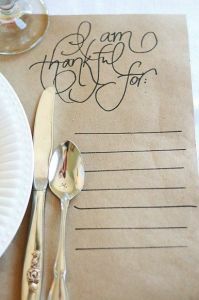 I saw this placemat on Pinterest years ago and thought how cute! I figured once Thanksgiving became my holiday in my family’s rotation of holiday meals that I would probably use this idea. It’s an easy way to keep people entertained while you move food to the table as well as gets people thinking about what they have to be grateful for. On the pragmatic side, clean up has to be pretty easy with the placemat being made of butcher paper. I wish I knew the original source for this idea but as I said I found it a while back. If you know, let me know so I can give them the proper credit. This was an idea I heard from a dear friend of ours that they did each year. Every year they would go around the table and first share some of the things they were thankful for in their lives. Then they would go around the table and pray a very personal prayer for someone they knew was in need of prayer, healing or God’s grace. I love this idea and I think I might even start it this year. Essentially, each year you get a Turkey Ticket which holds a 6 foot long (but about a cash receipt wide) sheet of paper in a roll. It is your invitation to Thanksgiving dinner. But before you can sit at the table, you would have all of November to fill out the 6 foot paper with what you are grateful for that year. For little ones, they can draw pictures instead of writing it out. Love this idea from Let’s Get Together. Typically my family gives through church to the causes it supports and to DELTA Rescue, an animal rescue and sanctuary that I started supporting years ago. But perhaps its something that the family needs to get behind. Someone I knew once shared that at Thanksgiving their family would pick a charity that they as a family would collectively give to that year. They each brought a new charity (or one that had not been supported the previous year) to the table, pitched why that charity should be supported that year and then they voted. Many people will serve others over the Thanksgiving weekend by working at a soup kitchen or homeless shelter. I know our church serves the local homeless for two weeks during the winter by housing and feeding them as a part of a local church rotation during our winter months. But giving time at a soup kitchen or homeless shelter (Thanksgiving weekend or other) is a real eye opening, humbling and unbelievably gratifying opportunity to serve and give to others. For me it reminds me, there but the grace of God, family and friends, go I.
I know several families already do this and its something my extended family started doing a few years back. Do a name exchange for Christmas gifts and Christmas lists. This was something that my brothers and I LOVED to do. And with three kids in the family, someone would always be the odd man or woman out each year. So while a definite fun tradition, and I can remember getting a few of my wishes, I definitely suggest having some kind of system to who gets to break the wishbone. We rotated every year. Two out of three years you got a chance at the wishbone and one year you were odd man out. Believe me, we remembered whose turn it was but it might be worth putting it in the calendar. I can’t remember any local Thanksgiving parades near where I grew up but I saw multiple suggestions for this when surfing for potential and possible traditions. I loved that they made it an event. Getting all bundled up, grabbing hot chocolate or cider and walking (or driving) to their local city’s parade. If our family adopts the tradition, we will be like many and watch the huge floats and enjoy the Macy’s Day parade from the comfort of our home, snuggled on the couch with our hot cider. Apparently the tradition of football on Thanksgiving goes back a long ways. The first Thanksgiving Day American Intercollegiate Football Association championship game was held in 1876 or at least it was according to the Library of Congress. And watching football, or at least having it on the TV, has been a long standing tradition in our household for many generations…at least with the men. Perhaps I can get that game to move outside. If you have a large backyard or a local park or park area, take the family and start your own “touch” football game. We have a small grove area not too far down from our house that I think might be perfect and is definitely a possible tradition to consider. Truthfully, this is one I am looking forward to the most as an avid DIY-er and crafter. 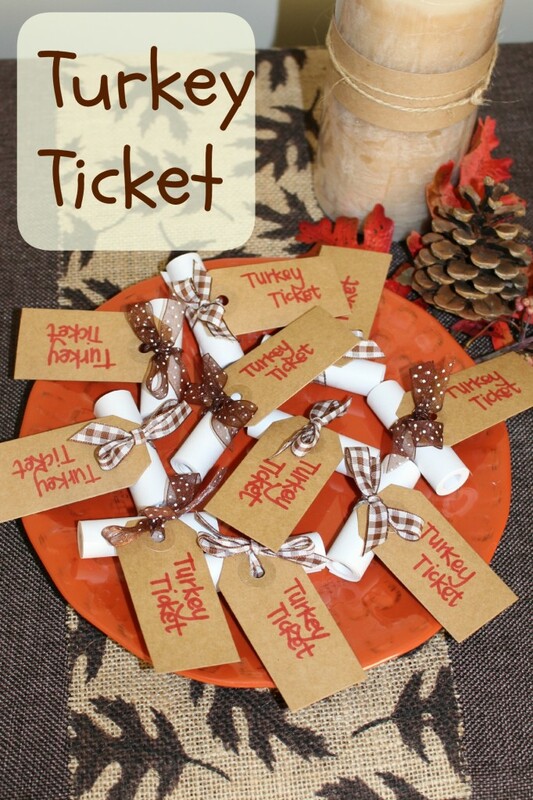 I can remember building turkeys with pinecones and all sorts of fun crafty items that were so cool as a kid and I can’t wait to do them with my little ones. Some how I just can’t see getting my 16 year old to sit down and make pinecone turkeys with me. *SIGH* It will just have to wait for more little ones. I plan on swiping this one idea from Spoonful of Imagination. 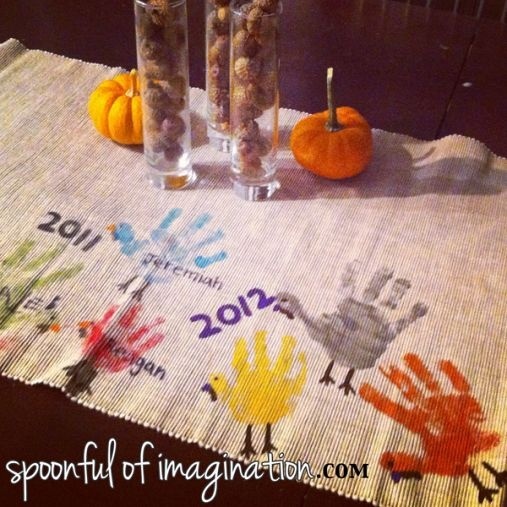 Its this super cute DIY table runner. 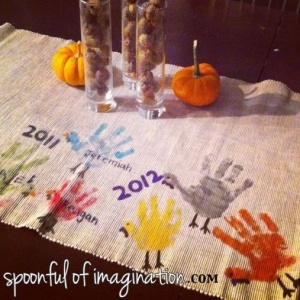 Each year, you have your kids add a handprint turkey to the table runner, labeling each year and each kid. Not only super cute but it can become a family heirloom. I adored watching this and all the other Peanuts holiday cartoons. Besides just being cute and good entertainment, there almost always was a deeper meaning that could be found – intended or not. So this one will definitely be on my traditions lists to do with my family starting this year! I’d love to know what traditions you do with your families. I read that one family started watching as a new couple A Muppet Christmas Carol each Thanksgiving night and it kind of stuck. What do you do? So many great ideas! Love it!